Organic compounds from terrestrial and marine organisms have extensive past and present use in the treatment of many diseases and serve as compounds of interest both in their natural form and as templates for synthetic modification. 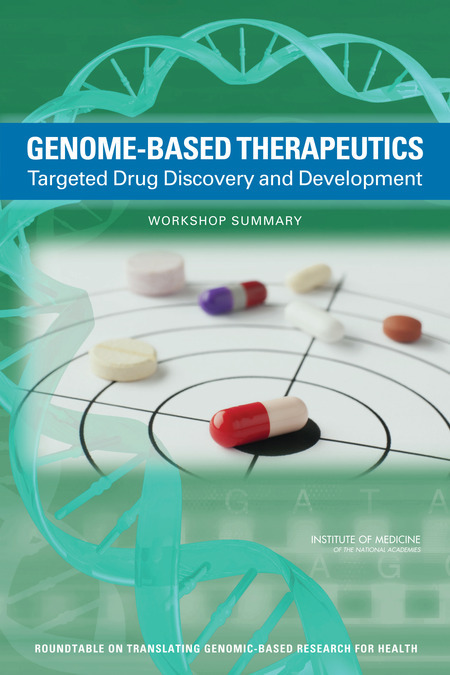 Over 20 new drugs launched on the market between 2000 and 2005, originating from terrestrial plants, terrestrial microorganisms, marine organisms, and terrestrial vertebrates and invertebrates, are described. These approved substances, representative of very wide chemical diversity, together with several other natural products or their analogs undergoing clinical trials, continue to demonstrate the importance of compounds from natural sources in modern drug discovery efforts.For thousands of years, natural products have played an important role throughout the world in treating and preventing human diseases. Natural product medicines have come from various source materials including terrestrial plants, terrestrial microorganisms, marine organisms, and terrestrial vertebrates and invertebrates. The importance of natural products in modern medicine has been discussed in recent reviews and reports. The value of natural products in this regard can be assessed using 3 criteria: the rate of introduction of new chemical entities of wide structural diversity, including serving as templates for semisynthetic and total synthetic modification, the number of diseases treated or prevented by these substances, and their frequency of use in the treatment of disease. The integrated Approach of Antibiotics Screening are:Microbiology: it includes Isolation of Bacteria, characterization, phylogenetic studies, culture preservation, Biological Screening (antimicrobial activities, cytotoxic studies etc).Medicine: it includes Clinical trials, cell line inhibition etc. 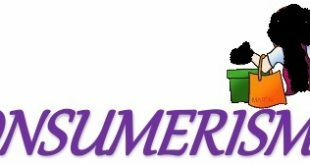 Biotechnology: it is the Genomics, Scale up, media optimization, strain improvement, Fermentation etc. Chemistry: it includes Chemical screening, isolation and purification of compounds, structure elucidation etc. After selection of source which is targeted for obtaining active compound. The active compound is extracted by solvent extraction methods. After extraction of active compound the biological screening (antimicrobial activity and cytotoxicity assay) and chemical analysis of active compound is done by chemical screening that (include HPLC and TLC). The column chromatography is used for the purification of fractions of active compound. Total five Actinomyces strains AS-1, S1-D, D-9, andD-11were collected from lab. Strains were streaked on GYM agar plates and incubated at 28oC for 7 days. These Actinomyces stains were then further screened for their likelihood potential to produce secondary metabolites. In order to get the cell free extracts of the active strains, 100 mL shaking cultures of these strains in GYM broth were incubated at 28°C for 7 days on a rotary shaker at 95-110 RPM. (Shirling and Gottlieb, 1968). 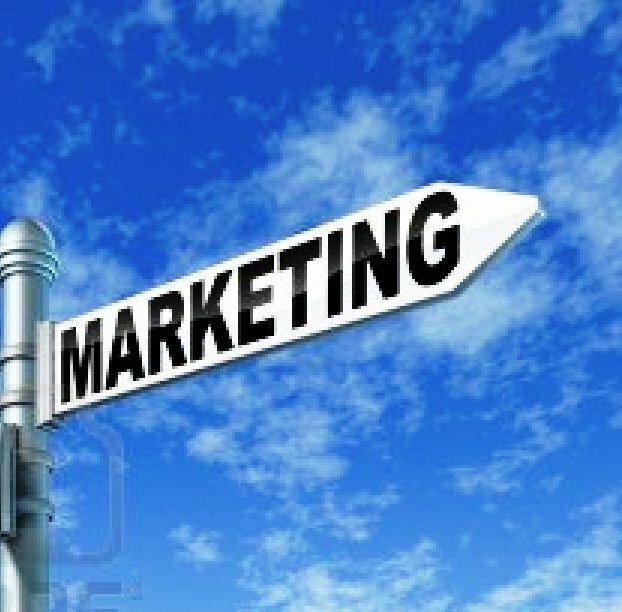 It is also called separating funnel method. In a 1000 mL separating funnel 200 mL of culture broth and an equal volume of ethyl acetate was added. The separating funnel was shaken vigorously for 10 minutes then the content is allowed to settle making two distinct layers. The upper solvent layer was removed carefully by separating funnel. The solvent was then evaporated using vacuum rotary evaporator, and the final dried extract was dissolved in 3-4 mL of methanol and was stored in glass vials at 4oC (Sajid et al., 2009). These extracts were used for TLC and HPLC analysis and disc diffusion inhibition was also estimated by using these crude extract. Culture broth of active strains, mixed with inert celite (SiO2) powder, was lyophilized at -20 to -80oC temperature. Celite bed was prepared using Bookner’s funnel made up of china clay having pore at its base. A uniformly wet whatman filter paper was placed at the base and funnel was adjusted on a suction falsk which was connected to a vacuum pump that eventually draw out whole liquid content of funnel. Slury, made of celite and water, was carefully poured over the funnel to make an evenly distributed celitebed. The freeze dried, lyophilized, cell mass, dissolved in ethyl acetate solvent was blended and sonicated for 10-20 min, The mixture was then overlaid on prepared celite-bed and ethyl acetate filtrate containg active substances was saved. The top layer of celite containing cellular mass was repeatedly extracted 2-3 times with ethyl acetate. The final volume of solvent was then taken to rotary evaporator and the final dried extract was dissolved in 3-4 mL of methanol and was stored in glass vials at 4oC. 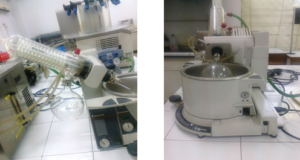 Fig 1: Rotary Evaporator; Rotary evaporators are used to remove solvents from reaction mixtures. 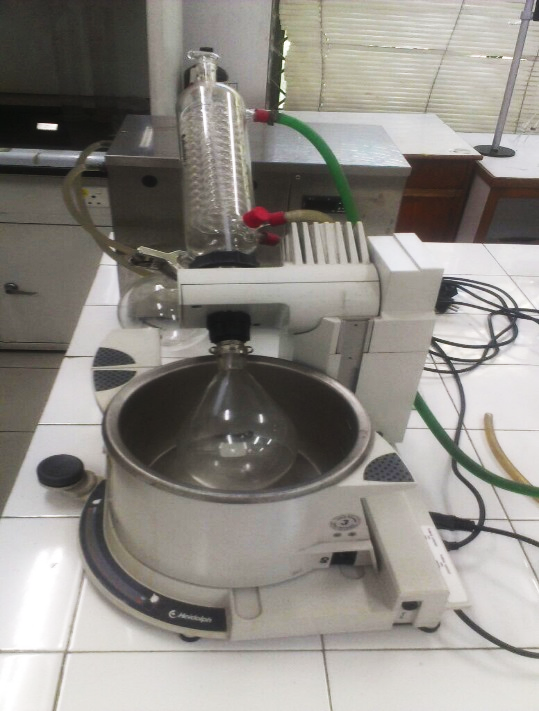 A typical rotary evaporator has a water bath that can be heated in a metal container. This keeps the solvent from freezing during the evaporation process. The solvent is removed under vacuum, is trapped by a condenser and is collected for easy reuse or disposal. Since the flask is rotated during the evaporation process, the surface area is larger than normal which increases the evaporation rate significantly. The solvent is collected in a flask and can properly be disposed off afterwards. In addition, this method also avoids overheating of the target compound i.e. oxidation because lower temperatures are used. The following steps include in this method. Preparation of test plate: Test plate wasrepared by plate overlay method so, that known and uniform density must be present on plate. We prepared plate with 16ml of MH media and allow the plate to solidify. Remaining 4ml media was taken in separate vial. Than inoculum was standardized(1 McFarland) contain 38*cells/ml in this media. Then pour this vial on agar media plate. This lawn that was prepared is standardized not random. Preparation of Disc: Take filter paper make disc of 9mm or 6mm by disc puncture. We prepared appropriate dilution of crude sample in methanol (1mg/1ml). Arrange the disc on glass surface or metallic surface in a line and load 50ul dilutions of strains AS-1, S1-D, D-9, andD-11. Air dry the disc, methanol evaporate and collect dried discs. Place discs on agar plate. One empty disc on which no crude compound present also placed on agar plate as negative control. A know antibiotic disc (ampicillin) placed on plate as positive control.Crude substance on each disc should be greater than 100ug. . Plates were left at room temperature for about 2 hours and then were incubated at 37oC for 18-24 hours. Plates were observed for clear hallows around discs. The formation of clear zones indicates growth inhibition of the test organism by the production of bioactive compound by the isolate. The diameter of the zone of inhibition was measured in millimeters and was recorded. 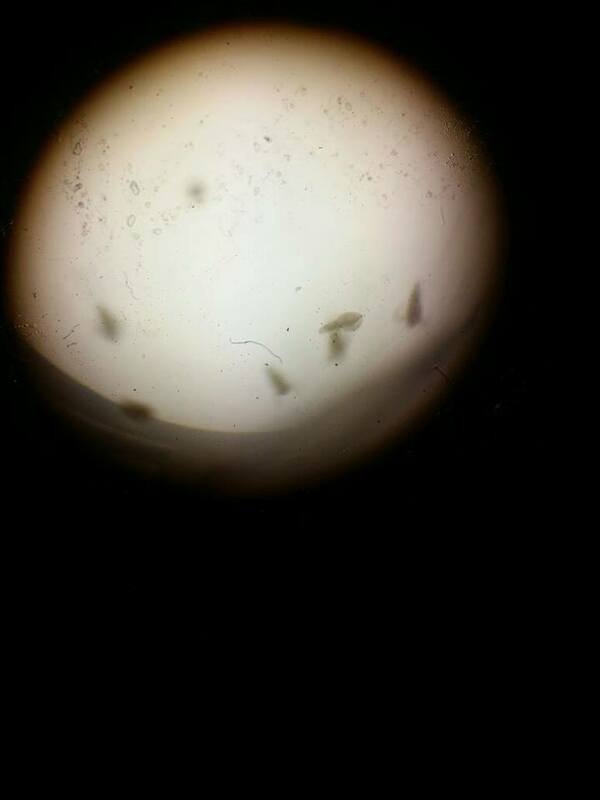 Cytotoxicity of crude extracts of the selected Actinomyces strains was determined against brine shrimp (Artimiasalina). The shrimp lethality assay was proposed by Michael et al. 1956, and later developed by Vanhaecke et al. 1981, and Sleet and Brendel in 1983. It is based on the ability to kill laboratory cultured Artemianauplii (brine shrimp). The assay is considered a useful tool for preliminary assessment of toxicity (Solis et al., 1993) and bacterial metabolites toxicity, plant extract toxicity, heavy metals, cyanobacteria toxins (Jaki et al., 1999), pesticides (Barahona and Sanchez-Fortun, 1999), and cytotoxicity testing of dental materials (Carballo et al., 2002). For chemical screening TLC and HPLC techniques were used. Chemical screening using these techniques offers a great opportunity to visualize nearly a complete picture of microbial secondary metabolite pattern (metabolic finger-print). Based on their metabolic finger print pattern, microbes can be classified according to their ability to produce metabolites. TLC (Thin Layer Chromatography) is one of the simplest methods used for the detection of constituents of a crud extract. Secondary metabolites produced under specified culture conditions in appropriate quantity can only be recognized with relative certainty when the thin layer chromatograms of various isolated raw products are stained with appropriate spray reagents. To perform TLC of our obtained crude extracts a silica coated aluminium TLC plate was prepared for use. We drew a line with lead pencil about one inch from the base of TLC plate and sample numbers were labelled in sequence at an equal interval space. Using Pasteur pipette, with tip bend on, the sample extracts were spotted on TLC plate by superimposing more drops on original spot and allowed for drying. 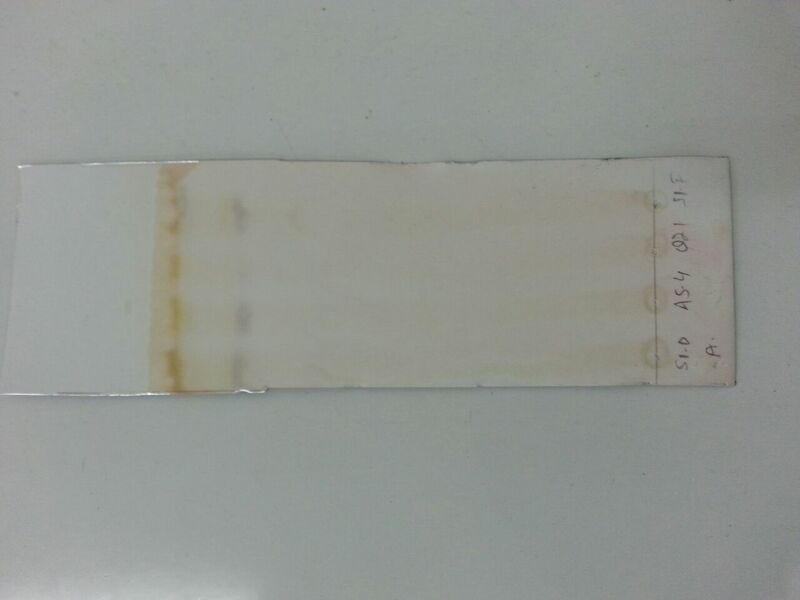 Dried TLC plates were then developed with solvent system consisting of 10% methanol in dichloromethane (CH2Cl2). 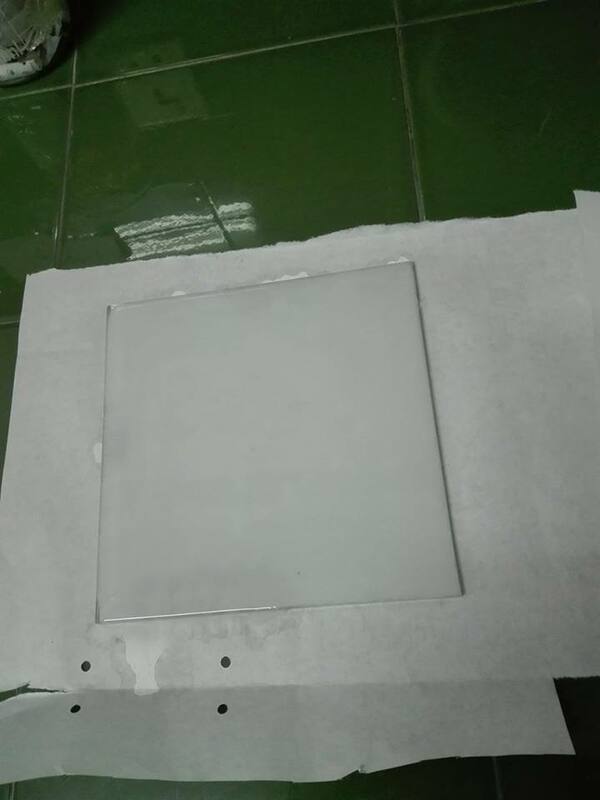 While placing the TLC plate in chromatography tank, it was made sure that spotted line is not dipped in solvents rather lies half inch above from solvent surface. Allowed solvent to travel along one third of the TLC plate. 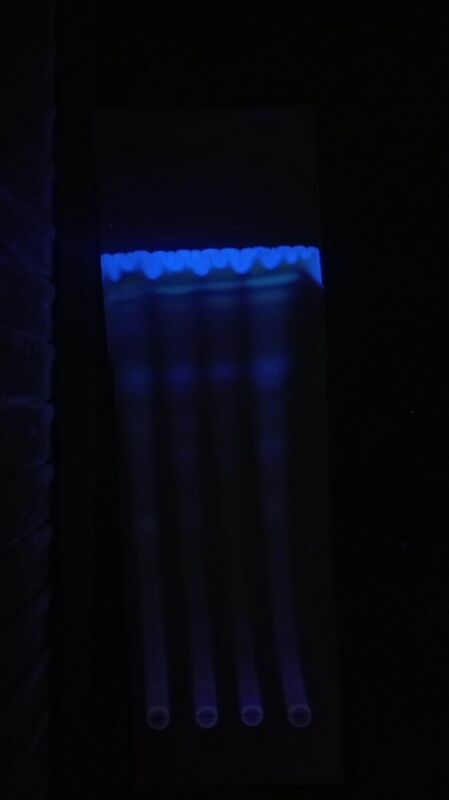 After drying TLC plates were visualized under UV light at 366nm and 254nm. The components showing UV absorbance and fluorescence were marked. Afterwards the TLC plates were sprayed with staining reagents for further localization of interesting zones. Anisaldehyde/H2SO4and Ehrlich’s reagent were separately used and plates were dried under hot air oven and room temperature respectively. Fig 2: U.V Cabinet; The UV Cabinet is designed for inspecting thin-layer chromatograms or other objects under UV light in absence of ambient light. 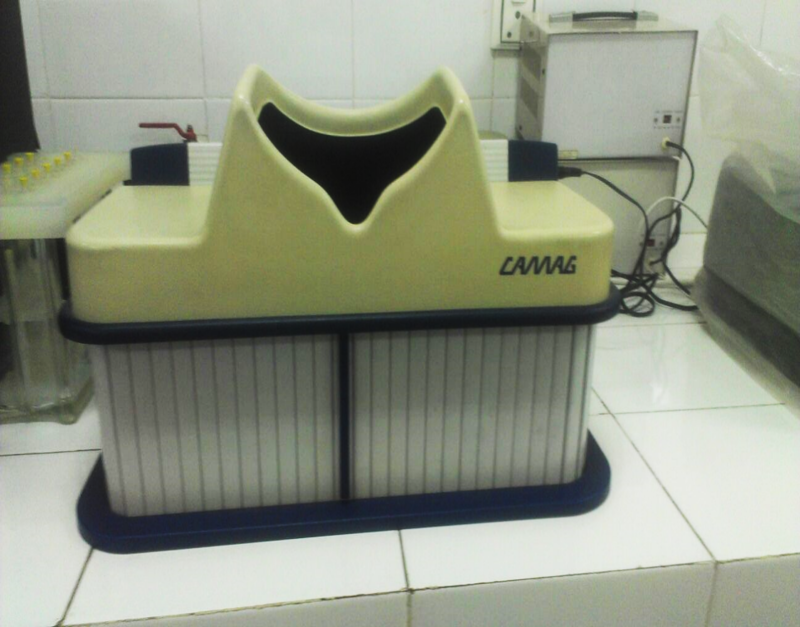 The UV Cabinet consists of a UV Lamp and the Viewing Box. The front of the Viewing Box is closed with a roller shutter. Eyes are protected by the UV filter in the viewing window. The distance between UV lamp and object is optimally selected for homogeneous illumination and observation of the entire plate through the viewing window. 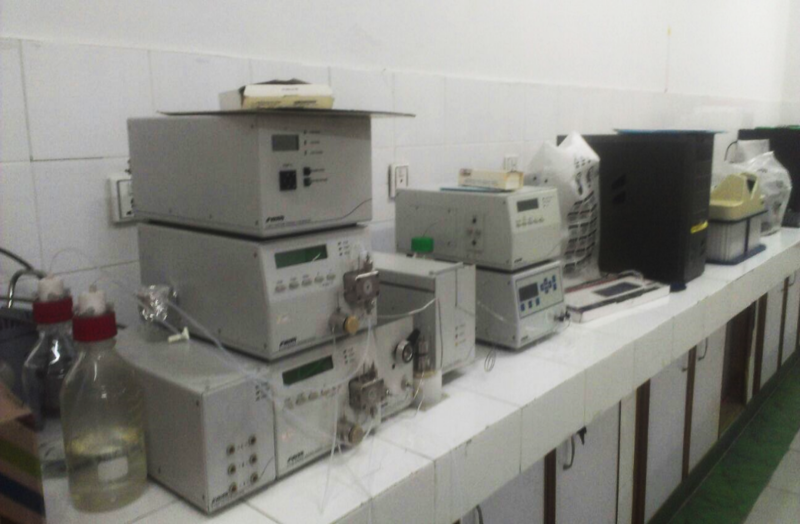 Fig 3: HPLC System; High-performance liquid chromatography is a technique in analytical chemistry used to separate, identify, and quantify each component in a mixture. It relies on pumps to pass a pressurized liquid solvent containing the sample mixture through a column filled with a solid adsorbent material. Each component in the sample interacts slightly differently with the adsorbent material, causing different flow rates for the different components and leading to the separation of the components as they flow out the column. Manual column chromatography was used to purify individual chemical compounds from mixtures of compounds (to purify the fractions of active compound). It is often used for preparative applications on scales from micrograms up to kilograms. It consist of two phased stationary phase (powder like material packed inside column and mobile phase. Glass column used in which stationary phase is packed. The length of glass column is 50-100cm and inside diameter is about 0.5-5cm. If length of column increase than, the resolution of chemical compound will also increase. The manual column chromatography consists of following steps. Take stationary phase silica gel mix in solvent. Slurry of gel is made. Fix the glass column in straight position. First observe either frit is present at the bottom of column, if not than adjust cotton plug by yourself in column. Add slurry from upside as a result gel will settle down inside it. One most important precaution in packing of column is never let your column to be dried. The solvent level should be above of the gel. First dissolve the sample in little quantity of solvent (mobile phase) 2-3ml. than load it in column. Sample loads along the wall of column, so that it does not disturb gel bed. Use small amount of solvent to remove sample residues. Set particular flow rate of solvent, solvent moves down and exclude drop by drop at the same rate. There are two different types of elution gradient elution and simple elution. In simple elution only one type of solvent is used while in gradient elution composition of solvents change with time. Like first 10% methanol use than 70% methanol used in order to elute particular component from sample. There are two ways to collect the fractions manual fraction collecting and automated fraction collection. In manual fraction collection open column take vial and collect the solvent like blue color solvent collect than change the vial when color is change. Or set collection in this way that vials change after collecting 10-20ml. 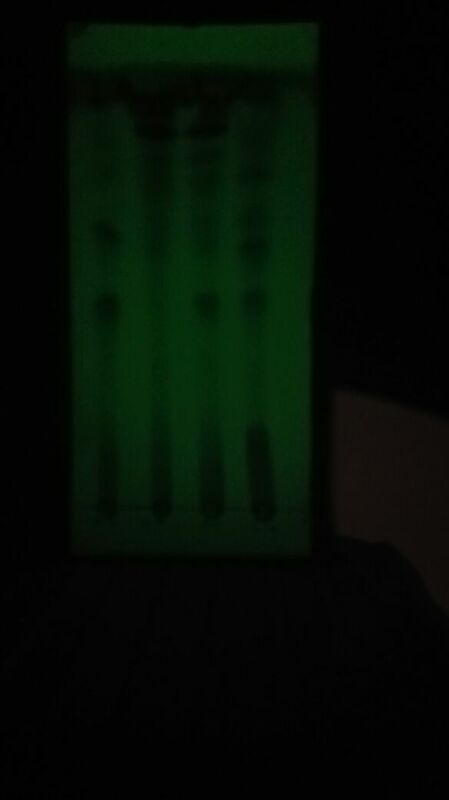 Fractions were detected by paper chromatography, TLC. Each fraction is separately treated. Preparative Thin Layer Chromatography (Prep TLC) is a useful technique for the purification of small quantities of sample. Because it allows for rapid separation of a number of components in a reaction mixture, it is especially useful for obtaining a profile of the products of a test reaction or the components of natural extracts. It is one which takes practice to determine with methods work best for you and your current separation. Typical plate dimensions: 20 cm x 20 cm, 2.5 mm SiO2 thickness. Rough Loading capacities: 10-25 mg difficult separation, 25-50 mg medium separation, 50-90 mg easy separation. Gently mark a pencil line roughly 1-1.5 inches from one side of the plate (careful not to scrape the silica gel). This is the “origin” line. Prepare a relatively concentrated solution of your crude sample (~1-2 mL) in a fairly low-boiling solvent (i.e. DCM or Et2O). Warning: too large a volume will require multiple applications which broadens the band. Using a short pipet, carefully deposit a thin line of sample across pencil line, avoiding the edges (stay roughly an inch away from each edge of the plate). It is very important to do this slowly and uniformly, without contacting the pipet too much against the silica as this will scrape it. The main difficulty is trying not to accidentally plunger too much at one place. Intentionally drawing the solution into the pipet such that there are periodic air spaces up the stem can make application easier, as well as sucking up a small amount of solution at a time into the pipet. Sometimes using a syringe and needle helps in controlling the dispensing, but the needle may scrape the silica too much. Apply remaining solution repeatedly on the original line of sample, drying in between applications. Not drying fully after an application will cause the solution to diffuse outward, broadening the band. Also try to spot in areas that didn’t get much sample to make the line of uniform sample loading. Obtain a prep TLC chamber. This is a large, heavy, square glass chamber. It is useful at this point to narrow the sample band by running a polar solvent (typically Et2O or EtOAc) up the plate to the upper edge of the band, and then evaporating the solvent (this should be repeated as needed, typically 3 times). Then in a dry chamber prepare about 100 mL of eluent. The ideal eluent should give your compound an Rf of around 0.1 on regular TLC. This will allow multiple elutions if the first one doesn’t separate well enough. Place the plate in the chamber and seal the top with the lid or aluminum foil. A typical run takes 40 mins to 1 hour. Remove the plate and visualize under UV. If your desired band(s) are not separated enough, repeat run another elution. If you need to stain the plate to see where the band(s) is, you can pipet a thin line of the stain down an edge of the plate, and heat. This will reveal approximately where the bands are, going across the full width of the plate. Scrape off each band of interest with a spatula or razor blade. Some find it easier to do this while the plate is still wet from eluting (you need to work fast), since dry silica dust tends to blow or move around more easily. There are a couple of different methods to retrieve your sample at this point: placing the silica gel in a pipet with a cotton plug, and washing with polar solvent is often sufficient; another option is to sonicate the silica gel in a polar solvent or one which causes the compound to elute fast on TLC, then filter through a frit and concentrate the purified compound. Crude methanolic extracts of 4Actinomycesstrains obtained by celite bed method and solvent extraction method of continuous shaking cultures of Actinomyces, were subjected to biological screening for their antimicrobial activity and cytotoxicity. Artemia Salina (brine shrimp) has been attributed as a model organism for laboratories to determine the toxicological effects of chemicals used in biological assays. Artemiasalina is easy to breed in laboratories and is inexpensive. Its dried eggs are available to hatch them in artificial sea water that is continuously aerated. As-1 shows one major peak at 2.47min. For the discovery of new active compound from natural sources all of these procedures provide an active attempt that how we cultivate the targeted strain and how we isolate active compound from source (strain) and how we screen them for their biological activity and chemical activity. We used GYM media because it is selective media for cultivation of Actinomyces. 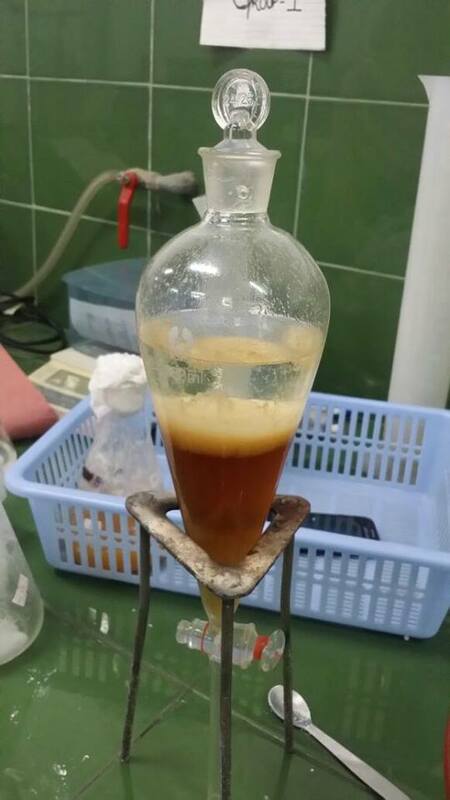 After growth of strain the active compound extracted from broth media by solvent extraction method by two procedures. As both procedure of solvent extraction methods are effective, but if quantity of broth is large than bed filtration method is more effective as compared to separating funnel method. 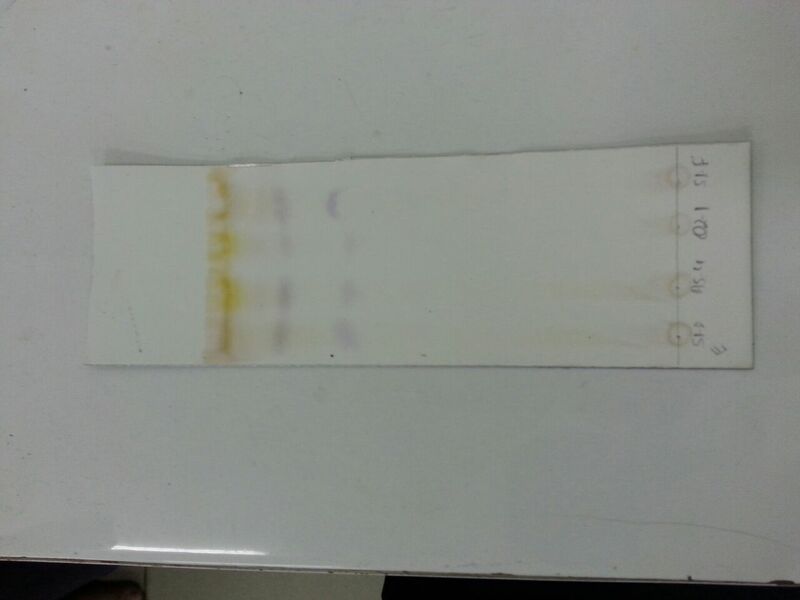 After effective extraction of active compound the compound is further screened either it shows some biological activity or not. There are various methods which can be used for analysis of antimicrobial activity but we preferred Disc diffusion method because it is quantitative method in which standardize inoculum of test bacteria is used. The results of disc diffusion method show that crude compound is not too effective against gram positive and negative bacteria because small zone of inhibition was obtained.AS-1gave 5mm and 5.2mm zones against gram positive and gram negative bacteria, S1-Dgave 5.1mm zone against gram positive bacteria,D-9gave 6mm and 5.3mm against gram positive and gram negative bacteria, andD-11strain gave 6.2 and 5.9mm zones against gram positive and gram negative bacteria. 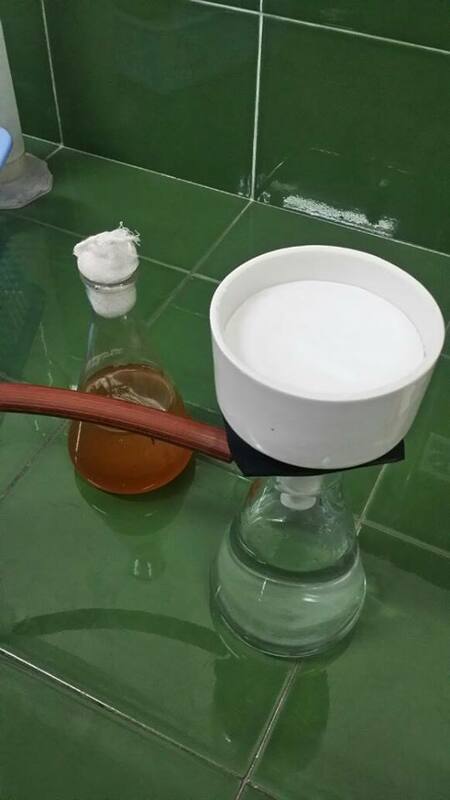 The crude extracts were further analyzed for its cytotoxicity activity against Artemia Salina (brine shrimp). The results show that strain Q2-1 has highest cytotoxicity activity 54% as compared to other strain so this cannot be further developed as antibiotic but can be developed as antitumor compound if it has selective cytotoxicity against tumor cells. The loweswt cytotoxicity was given by D-16 strain and it was 26%. The strains with less cytotoxicity can be further develop as antibiotic. The metabolic finger printing of active compound was done by HPLC and TLC. 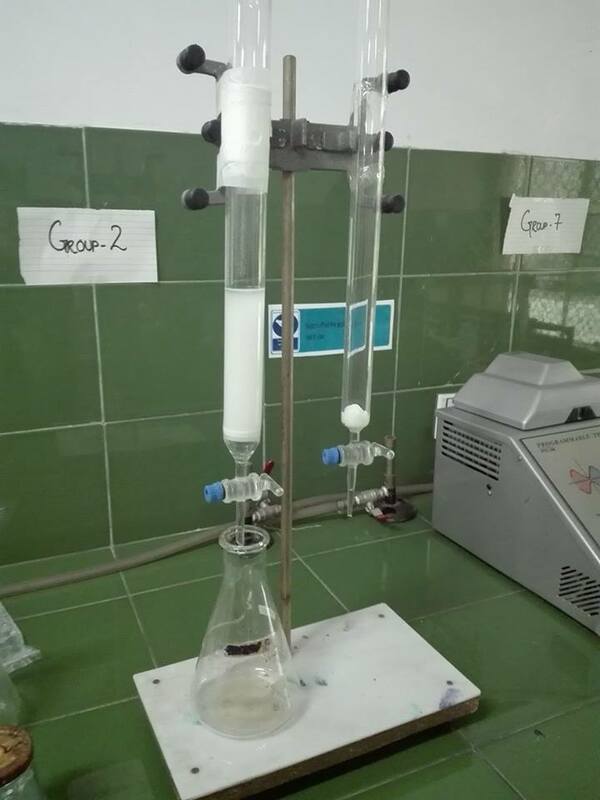 The purification of fractions of crude compound was done by manual column chromatography and preparative TLC. An improved method for purification of intact metagenomic DNA from soil has been developed using Q-Sepharose, which purified the DNA from phenolic and humic acid contaminants in a single step. The entire procedure for purification took only 45 min. The purified DNA readily digested with restriction enzymes and can be further used for molecular applications. Soil samples was collected and DNA from soil extracted by the method of Zhou et al. (1996). Sieved fine soil (0.5 g) extracted with 1.3 ml of extraction buffer (100 mMTrisCl, pH 8.0, 100 mM EDTA, pH 8.0, 1.5 M NaCl, 100 mM sodium phosphate, pH 8.0, 1% CTAB). After proper mixing, 13 ll of proteinase K (10 mg/ml) was added. All eppendorf tubes were incubated horizontally at 37C with shaking for 45 min, after that 160 ll of 20% SDS was added and vortexed for 30 sec with further incubation at 60C for 2 hours. The sample in each eppendorf was mixed thoroughly after every 15 min interval. The samples were centrifuged at 5000 · g for 10 min. The supernatant was transferred into new eppendorf tubes. The remaining soil pellets were treated three times with 400 ll of extraction buffer, 60 ll of SDS (20%) and kept at 60C for 15 min with intermittent shaking after every 5 min. The supernatants collected from all four extractions was mixed with equal quantity of chloroform and isoamyl alcohol (24:1) and extracted three to four times. Aqueous layer was separated and precipitated with 0.6 volume of isopropanol. After centrifugation at 12,000 · g for 15 min, the brown pellet was washed with 70% ethanol, dried at room temperature and was dissolved in TE (10 mMTrisCl, 1 mM EDTA, pH 8.0). DNA concentration was estimated spectrophotometrically. 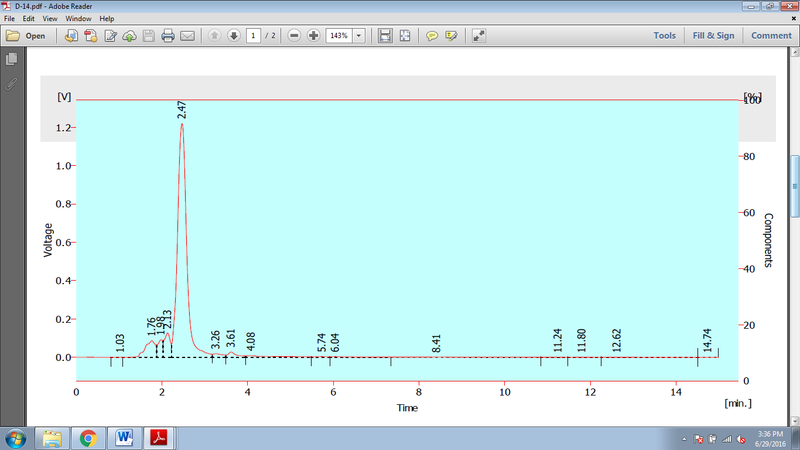 DNA was analyzed for restriction enzyme digestion analysis by Sau3A1 for 15 min. Solis, P. N., Wright, C. W., Anderson, M. M., Gupta, M. P. and Phillipson, J. D. 1993. 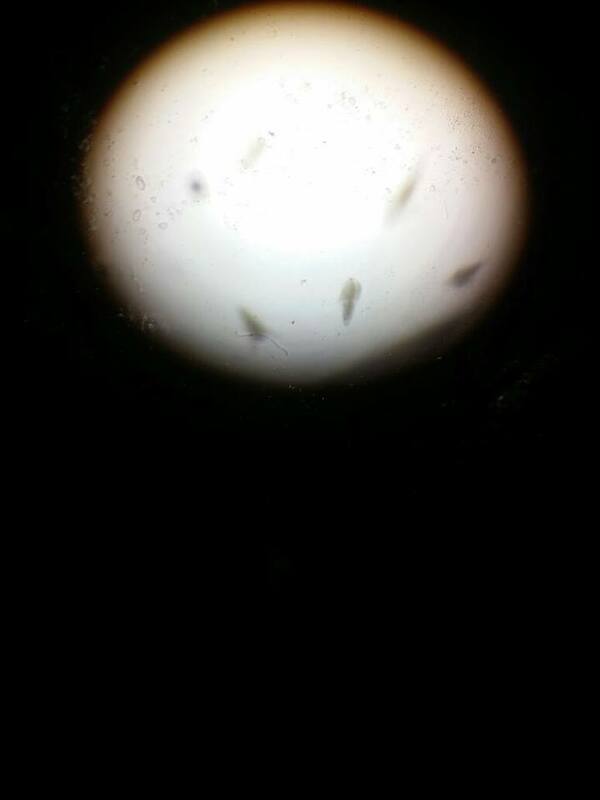 A microwell cytotoxicity assay using Artemia salina (brine shrimp). Planta Medica, 59:250-252. Carballo, J. L., Hernández-Inda, Z. L., Pérez, P. and García-Grávalos, M. D. 2002. A comparison between two brine shrimp assays to detect in vitro cytotoxicity in marine natural products. BioMed Central Biotechnology, 2:17. Barahona, M. and Sanchez-Fortun, S. 1999. Toxicity of carbamates to the brine shrimp Artemia salina and the effect of atropine, BW284c51, iso-OMPA and 2-PAM on carbaryl toxicity. Environmental Pollution, 104:469-476. Sajid, I., Yao, C. B. F. F., Shaaban, K. A., Hasnain, S. and Laatsch, H. 2009. Antifungal and antibacterial activities of indigenous Streptomyces isolates from saline farmlands: prescreening, ribotyping and metabolic diversity. World Journal of Microbiology and Biotechnology, 25:601-610. Shirling, E. B. and Gottlieb, D. 1968. Cooperative description of type cultures of Streptomyces III. Additional species descriptions from first and second studies. International Journal of Systematic Bacteriology, 18:279-392. Shirling, E. t. and Gottlieb, D. 1966. Method for characterization of Streptomyces species. Int. J. Syst. Citeseer.